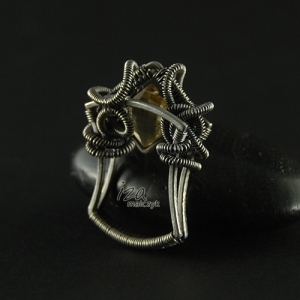 Unique ring made entirely by hand of sterling and fine silver and a faceted square citrine. Modern form wit a pinch of antique soul enclosed in oxidised swirls. The ring has been oxidised and polished. It's much more comfortable while worn that it might seem. Size 16-17 EU / 7,5-7,75 US (18mm in diameter).